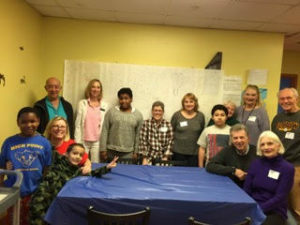 The Unitarian Universalist Congregation of the Palisades (UUCP) is one of the three congregations that put on the Bergen County UU Annual Outreach Auction last fall. The YCS Holley Center was one of the six charities that UUCP raised money for this year. The Holley Center houses about 86 children. They recently invited the Outreach Auction Team to come and see how the donation to them was spent. UUCP served cake and ice cream to about 50 children, and then went to a smaller room and had cake and ice cream with a few children from a special unit. They were able to buy new mattresses, and comforters funds that they received.